Game of Thrones Production Sound Mixer Daniel Crowley uses a wide array of DPA Microphones to capture every word in Westeros for the HBO mega-hit. With six different DPA models in constant use on set, he takes no chances in making sure every sound eventuality is catered for. The fate of Westeros hanging by a thread as the White Walkers head south of The Wall, leaving Game of Thrones fans all over the world waiting with bated breath. Every word is as crucial as the next and Daniel Crowley ensures viewers hear it all with crystal clarity. “My first encounter with DPA was in music recording studios and I was drawn to the transparency of the sound the mics captured,” says Crowley. When DPA started to develop its film and broadcast offerings, I was instantly a fan. Having been a boom operator for 15 years, I know how important a microphone and boom op are to the quality of what we deliver on a production. DPA lavs are preferred by all location sound crews on Game of Thrones and post production demands them. To me, no other microphone captures an actor’s performance with as much integrity and authenticity as DPA. I believe the mic quality has a direct impact on how much an audience engages with an actor’s performance, which is why I exclusively use DPA for Thrones. In total, Crowley uses six different DPA mics on set. For lavaliers, he uses DPA d:screet™ 4063 Miniature Omnidirectional lavaliers with Lo-Sens & DC and d:screet™ 4080 Miniature Lavalier Cardioid Microphones. On boom, Crowley uses d:dicate™ 4011A and 4011C Cardioid and d:dicate™ 4017B and 4017C Shotgun Microphones. “My favorite mic is the 4011C on the boom for interiors,” continues Crowley. After years of use, it still amazes me how much detail is captured, even when pushed out by lighting or some other extraneous force. 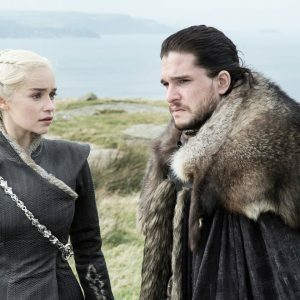 In the most recent episode, Jon Snow pledged his allegiance to Dany, a scene where every word is important. Jon had no shirt on, which meant no lavs could be used, and the ‘morning sun’ lighting on top of the small four poster bed gave me mere centimeters above Jon and Dany’s heads. I could barely squeeze the 4011’s on poles over the actors, but even with limited space the results were astounding. This scene was mostly whispered but with my DPA’s the viewers didn’t miss a word.